Good to here things are going well at home still! Hope everyone has a good week too. Things are going pretty good here. I got my new companion today, Elder Soto, so we were pretty busy picking him up and dropping off Elder Ward and everything. It was a little more sad than I thought it would be saying bye to E. Ward but I was ready for a change at the same time. E. Ward is going to some place north of Culiacan a little ranch town I guess haha. He´s been in Mazatlan his whole mission too so he felt kind of weird leaving.. Elder Soto is from Hidalgo Mexico and I´m glad that I have a mexican companion now. He´s a little bit shorter than me too, so we definitely are a short companionship haha. He was in the Baja. He actually told me my spanish is pretty good today so maybe it´s better than I thought. I haven´t had any problems commmunicating with him yet either so that is good. Definitely will help me with learning how to speak better this transfer though. He seems like a hard worker and I´m hoping that we can have some more success in our area this transfer! He´s been out like 17 months I think. We have an investigator named Irwing that we are trying to prepare for baptism. His Esposa is pregnant right now and they are getting ready to have their second baby together. He´s really awesome and went to church yesterday. He already had talked with missionaries before but this time seemed more interested and excepted a baptismal date. They just have to get married so hopefully we can have a miracle with that happening in the future.. Besides that we also have an investigator named Maria de Los Angeles. She had some doubts with her faith because things werent going really good with her husband. E. Ward and I promised her blessings for living the Lord´s commandments and following the example of Jesus Christ and later that day her husband found some more work. So the next time we taught her she was all happy and excited to learn more about lessons. She has been reading in the Book of Mormon and wants to get baptized too, but just has to start coming to church... We have been visting some inactives and want to work more with the Ward. We´re trying to help the ward to grow and have some more excitement. This sunday there was a good amount of people (like 40 I think) and we reactivated an awesome Hermano in the ward.. We´re hoping to find a lot more people to teach this week and I´m going to teach E. Soto the area a little better. Hope everything continues to go well at home. Thanks for all the love, support, and prayers and always. P.S. 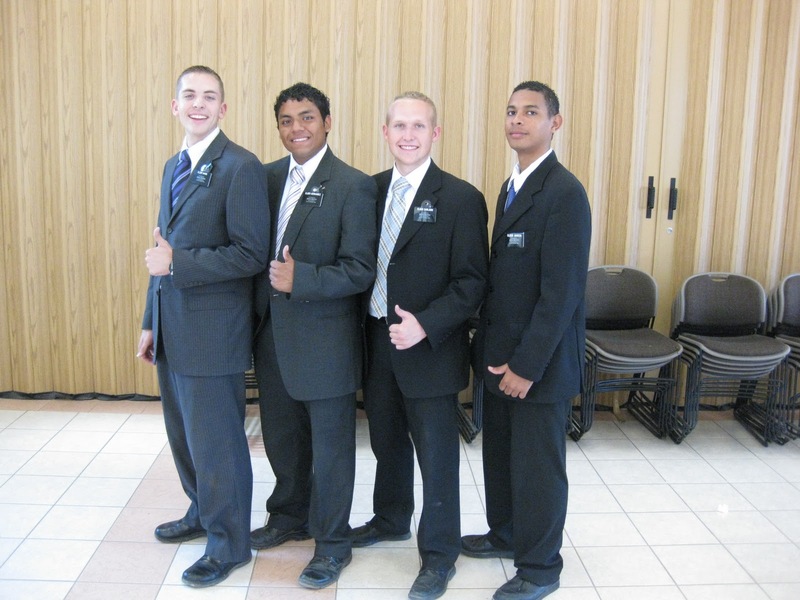 Here is a photo with us, Elder Hernandez and Garcia (far right). Garcia is the one from the dominican. Next week I´ll try to get a pic with my companion.